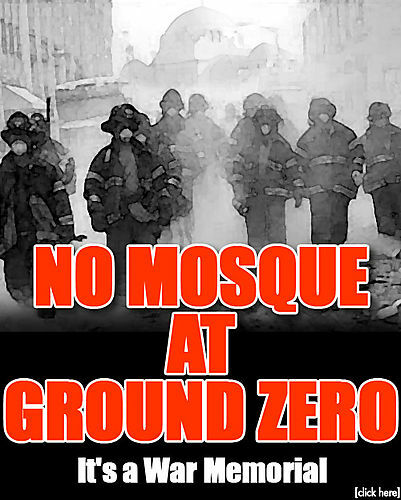 The controversy over the Ground Zero mosque couldn’t have happened at a better time. The fact that this obscene mega gesture of contempt for the American people, our way of life, and for the true martyrs who were butchered on September 11, 2001, is finding support from liberal lunatics is one of the best bits of political good luck for the conservative cause this summer. With the announcement today that the Manchurian Candidate masquerading as our president is openly and blissfully supportive of this shameful Islamic sham, the battle of the mosque has now been officially elevated to a national bone of contention. And with the November elections inching ever closer, we couldn’t have asked for a better boon from the Radical Chic Commander and Chief. Somehow I don’t think there are too many Democrats running for reelection in the Fall who are jumping for joy over this latest example of presidential political naivete. One has got to ask here: Who the hell in the White House is advising this arrogant Left-wing nut job? And please, whoever you are, keep up the good work! And another good outcome from all these mosque machinations. This contentious controversy has engendered a lot of rangling within the ranks of the Left-wing aristocracy. The mosque is a divisive issue that some liberals may embrace as an expression of tolerance and freedom of worship, but many other Lefties are beginning to feel just a wee bit wary of a religious institution that has absolutely no tolerance itself for any other faith let alone for any individual living a modern liberal lifestyle. But progressive propaganda pictures Muslims as innocent victims of American aggression, hence, entitled to a perpetual free pass on the basic values that modern Western civilization is built upon. Pay no attention to Islam’s belligerent bigotry toward Blacks. Look the other way when women are abused, humiliated, and murdered. Never mind Islam’s horrendous history of homophobia. All is forgiven, all is excused, and all is glossed over by the giddy gadflies of global progressivism. The recent revealing comment from Michael Bloomberg, mayor of New York City, encapsulates the progressive approach. In responding to Greg Gutfeld’s announcement on Fox’s Red Eye that he intended to open an Islamic gay bar directly across from the proposed mosque, Bloomberg stated that opening a gay bar so close to the mosque would be ‘insensitive’ since Muslim’s believe homosexuality is a sin. Now, can anyone imagine Bloomberg or any other card-carrying liberal making such a comment within any other context that would deliberately snub and backseat the gay community like this? Bloomberg’s back-of-the-hand to homosexuality is just one of the little rips and tears that can be and should be exploited by a conservative campaign to take back America. Greg Gutfeld’s gay bar suggestion, joke though it may be, put the progressives on the defensive. And such take-back tactics can help bring out into the open more of the idiotic nonsense passing as progressive public policy. Useful Idiots is a term of derision that was supposedly coined by Vladimir Lenin and used by the Soviet Union to describe Western intellectuals, writers, and journalists sympathetic to the communist cause, dupes who could easily be manipulated into serving the Soviet agenda. How very apropos this term is today in our war against radical Islam. And the best way to expose their progressive apologists is to continue to rip and tear at that multicultural patchwork of victim cliques serving as the Left’s mantle of moral superiority. This entry was posted in Political/Social and tagged Bloomberg, gay, gay bar, Greg Gutfeld, ground zero, homosexuality, Islam, Lenin, lesbian, Manchurian Candidate, mosque, muslim, New York City, obama, progressive, progressivism, Red Eye, Soviet Union, Take Back America, useful idiots. Bookmark the permalink. How hilarious is it that liberal progressives think it is okay for muslims to think homosexuality is a sin, but Christians are bigots for believing the same thing. I just want consistency and liberalism can only function under a system of exceptions. I also do not understand how an exclusive mosque for muslims will create a dialogue for the greater community; how can an exclusive establishment foster an inclusive identity? It’s amazing, isn’t it? I think Lefties are so obsessed with what they believe to be ‘wrong’ about America that they can’t distinguish a real threat when it’s pushed in their faces. And this mosque controversy is a disgrace. But again, if it had to happen, better that it’s happening now.